Dead or Alive creator Tomonobu Itagaki has left Tecmo's Team Ninja. He's been away, but has returned with a new start-up, unofficially dubbed the Tokyo Vikings. 1UP: What do you think about Bayonetta, as a game? Do you think Kamiya is right to follow the Devil May Cry formula so closely? TI: If I made a similar game as a game I made in the company I quit, people would say, "What an idiot, can't he make anything else?" Well, that is more or less the opinion I have for, uh, that Bayo-something game. 1UP: What do you think of Bayonetta's character design? She's covered in hair. TI: Covered in hair, is she? I dunno, Mr. Kamiya must have a lot going through his head. Well, in any case, I would first recommend laser eye surgery. I'm sure he's not that strapped for cash, right? A bit of background: Bayonetta designer Hideki Kamiya stated previously that he had never played Itagaki's Ninja Gaiden because he said the game "didn't have the power" to pull him in. Devil May Cry The Harlot And Bayonetta&apos;s Flesh Flashing Hair Attacks! Moving beyond the smack talk and Itagaki's recommendation that Kamiya get laser eye surgery if he's not strapped for cash (ouch), this chatter could provide clues regarding what the former Team Ninja lead ninja and his team are up to. Elsewhere in the interview, he says he's gotten tired of making games with girls that have enormous breasts and won't be making games with Aerosmith music anymore. 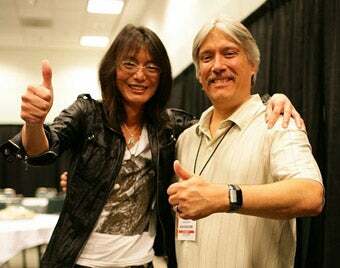 "I have to apologize to my fans, but since I won't be making Dead or Alive games," Itagaki explains, "I won't be using Aerosmith's music anymore. I want to send the deepest gratitude to Aerosmith and Steven Tyler. The power I needed to make DOA came from Aerosmith and the movie Armageddon." So is it safe to assume for the sake of assuming that Itagaki is working on something different than his previous games, something light on the norgs and something free of Aerosmith?